3. Rational Ignorance and political Beliefs. 3.1. Policies that might reduce fiscal illusion. Many political failure arguments implicitly assume that voters are irrational (Wittmann 1995, 1989; Coate and Morris 1995). The main resonance of this paper going to show that this assumption is plausible. This paper will show, why voters prefer to be ignorant, what logic is behind this behavior, what effects this ignorance could or may have in the election result. The Problematic of this paper is try to understand what issue may those behavior bring to election system and try to demonstrate what is properly RATIONAL ignorance?. Josh Billings (in Caruth and Ehrlich 1988, P.205) said “The trouble with people is not that they don´t know, but that they know so much that they ain´t so”; argued to this citation, we could conclude, that the RATIONAL ignorance is not because of failed information, but because voluntary refuse being informed. The subject person won´t being informed, because he doesn’t see any utilization of this information for him. The RATIONAL ignorance occurs when the cost of educating oneself on an issue exceeds the potential benefit that the knowledge would provide. Rational ignorance can be most funding in general elections case, where the voter see probability his vote to change the outcome as pretty small. Those voters will definitely not go to vote. We cannot analyze the rational ignorance, without analyze the fiscal Illusion, because that behavior could practically allow politics to misuse their power, or oriented policies in that way that citizen’s couldn´t follow and understand them. In their book Democracy in Deficit (1977) James M. Buchanan and Richard E. Wagner suggest that the complicated nature of the U.S. tax system causes fiscal illusion and results in greater public expenditure than would be the case in an idealized system in which everyone is aware in detail of what their share of the costs of government is. We could than define fiscal illusion as a situation when government revenue are unobserved by taxpayers then the cost of government is perceived to be less expensive than it actually is. The next part of this paper will try first to show the logic and effect of rational ignorance in the political process, the second part will than try to show how might politicians attempt to use rational ignorance to promote their interest, and this part will be following by the part, which will show the limit on the extent to which voter ignorance can be exploited and before conclude, we will that discuss about policies that might reduce fiscal illusion. On this part of paper, we will try to show how rational, rational ignorance could be, what that logic is and what effect this rationality could have. In case of Votes, voters are confronted with incentives and at the end the factor, which play a really biggest role is the self-interest. Like in the market consumers will only apply for products they need and will not try to get information concerning other products. Concerning the homo economicus model, voters or people will just care about information that brings them some incentives…. Information that does not affect their private interest will be neglected and they are in that case totally ignorant, but in the rationality. The origin of rational ignorance or ration irrationality come from sources of believes preference. And to understand what this mean we should try to answer this question “why do people prefer to believe some things that are not true or not supported by the evidence?” “What kind of irrational preferences do we have?” The properly answer of this questions going to be non scientific answer, because they are no studies, that support this. The first answer is a self-interested bias that support that people tend to hold political belief that, if generally accepted, would benefit themselves or the group they identify with. That means the reasons of rational ignorance of the conservative republican and that from the democrat will be completely different. The same reason will apply by people from different social level, independent of their level of education. The second answer is the Belief as self-image constructor, people prefer to hold political beliefs that best fit with the image of themselves that they want to adopt and project. For example, people that portray themselves as a compassionate, generous person will definitely have voted for Obama in 2008. The third answer will be a belief of coherence bias; people are biased towards beliefs that fit well with their existing belief. In one sense, of course, the tendency to prefer belief that well with an existing belief system is rational, rather than a bias. But this tendency can also function as a bias. For instance, there are many people who believe capital punishment deters crime and many who believe it doesn’t; there are also many who believe that innocent people are frequently convicted and many who believe that they aren’t. But there are relatively few people who think both that capital punishment deters crime, and that many innocent people are convicted. Likewise, few people think capital punishment fails to deter crime, but few innocent people are convicted. In other words, people will tend to either adopt both of the factual beliefs that would tend to support capital punishment, or adopt both of the factual beliefs that would tend to undermine capital punishment. On a similar note, relatively few people believe that drug use is extremely harmful to society but that laws against drugs are and will remain ineffective. Yet, a priori, there’s no reason why those positions (i.e., positions in which a reason for a particular policy and a reason against that policy both have a sound factual basis) should be less probable than the positions we actually find to be prevalent (i.e., positions according to which all or most of the relevant considerations point in the same direction). The forth answer is beliefs as tools of social bonding; People prefer to hold the political beliefs of other people they like and want to associate with. It is extremely unlikely that a person who doesn’t like most conservatives would ever convert to conservative beliefs. Relatedly, the physical attractiveness of people influences others’ tendency to agree with them politically. A study of Canadian federal elections found that attractive candidates received more than two and a half times as many votes as unattractive candidates—although most voters surveyed denied in the strongest possible terms that physical attractiveness had any influence on their votes. Based on the information from spryne t we could than better understand where the origins of rational ignorance or rational irrationality are. The next part of this work will more try to show what logic is to understand under this rational ignorance. The causes, that may push people to decide being rational ignorant or rational irrationally. To understand what the logic of Rational ignorance is, we should first try to explain why some ignorance can be rational and what is that mean. 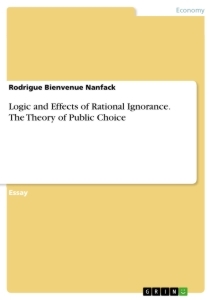 Like said in our introduction, the logic of being rational ignorant is only that the person won´t apply for information, because the information is not important for him or uninteresting for his goal or the i9nformation is more costly as his benefit. The logic is that, the cost of apply for those information are higher than benefit. The rational voter is interested only in information which might or could change his preliminary voting decision. First, a related theory. The theory of rational ignorance say that people often choose to been irrational (rational irrationality) because the costs of collecting information are greater than the expected value of the information. This truly apply for politic information. For example if we ask political student of the University of Münster who is their deputy in the regional parliament in Düsseldorf or in national Parliament in Berlin (Bundestag), most of them won´t know, because not because they are completely ignorant, but only because this information is pretty uninteresting for their goal or costly to them as a benefit this information will bring to them. That is the same when you ask many Germans about where Germany apply his Gas, mostly of them won´t be able to answer the question because they don´t have information about the origin of the gay they use to warm themselves in the winter. We can understand why people won´t apply for some information, because if you tried to keep track of every politician and bureaucrat who is supposed to be representing or serving you, you´d probably spend your whole life on that. You could probably know who you will vote by the next election, but the probability that your vote make the decision is so small and uncertain, because the other 900 000 voters in your district are still going to vote for whomever they were going to vote for before you collected the information. The similar cases also apply on the theory of rational irrationality that say that people often choose rationally to adopt irrationality beliefs because the cost of rational beliefs exceeds their benefits. Sprynet define two kind of rationalities: Instrumental rationality (or “means-end rationality”) and Epistemic rationality. Instrumental rationality consists in choosing the correct means to attain one´s actual goals, given one´s actual beliefs. This is the kind of rationality that economists generally assume in explaining human behavior. Epistemic rationality consist, roughly, in forming beliefs in truth-conductive ways, accepting beliefs that well-supported by evidence, avoiding logical fallacies, avoiding contradictions, revising one´s beliefs in the light of new evidence against them, and so on. From this definitions we don´t understand that people often think illogically because it is in their own interests to do so. This is particularly is typically the case of political beliefs. According to Caplan´s examples: If I believe, irrationally, that immigrants are no good at running convenience marts, I bear the costs of this belief; e.g., I may wind up paying more or traveling farther for goods I want. But if I believe (also irrationally) that immigrants are harming the American economy in general, I bear virtually none of the costs of this belief. There is a tiny chance that my belief may have some effect on public policy; if so, the cost will borne by society as a whole (and particularly immigrants); only a negligible portion of it will be borne by me personally. For this reason, I have an incentive to be more rational about immigrants´ ability to run convenience marts than I am about immigrants´ general effects on society. In general, just as I receive virtually none of the benefit of my collecting of political information, so I receive virtually none of the benefit of my thinking rationally about political issues. Compared to the ignorant voter, market ignorant is basically not ignorant; he is ignorant of details of the Marketplace, not its basics. The voters have any incentive to study and learn about the basics of politics. We should say at this place that this is not completely true, because everyone know something about politics; nevertheless empirical studies inform us that people (citizens) are more ignorant in politics than in the marketplace, and that form of ignorance is shocking. So we could keep at this way that rational ignorance is a phenomena, that exist and the reason is must basing on information. Information cost made prefer being irrational, and that rational ignorance is rational irrationality. Public Choice: Demokratie - Das klappt wohl nie? Das ‚Paradox des Wählens’ in der Rational Choice-Theorie - Ist Wählen irrational?